Cooking fish in the microwave retains the flavour and keeps your kitchen free of smells. Butter two large squares of greaseproof paper and place a 150g smoked haddock fillet on each. Mix 4 tbsp of frozen petit pois, 4 chopped salad onions and a slice of ham, roughly chopped, and spoon over the fish. Top each with 1 tbsp of crème fraîche and season. Fold paper over fish, seal at centre and tuck ends. 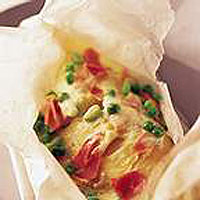 Cook parcels on a plate in the microwave on full power for 3-4 minutes, until the fish is just cooked. Serve with potatoes or rice.